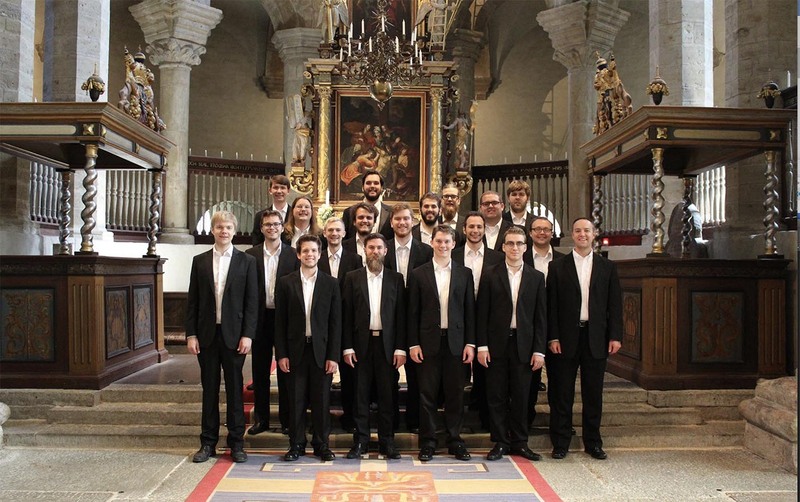 Miami's Schola Cantorum and Ars Veritas of Sweden at Varnhems Klosterkyrka, said to have the oldest traces of Christianity in Sweden, dating to the Viking Age in the 800s. Miami’s Schola Cantorum (Singing School), an ensemble comprising members of the Men's Glee Club led by conductor Jeremy D. Jones, had a once-in-a-lifetime opportunity this summer. They performed and recorded historic repertoire in collaboration with a professional men's ensemble in Sweden. “I am unaware of any similar opportunities with other collegiate groups in the United States,” Jones, conductor of Miami’s Men’s Glee Club and Collegiate Chorale, said. Schola Cantorum member Patrick Proctor said, "Singing Gregorian chant is something few vocal students at Miami ever experience." "To learn under a professional ensemble which sings this genre of music fulltime, to embrace their passion and knowledge while also experiencing a vastly different culture, was the opportunity of a lifetime." International music making: How did this collaboration start? 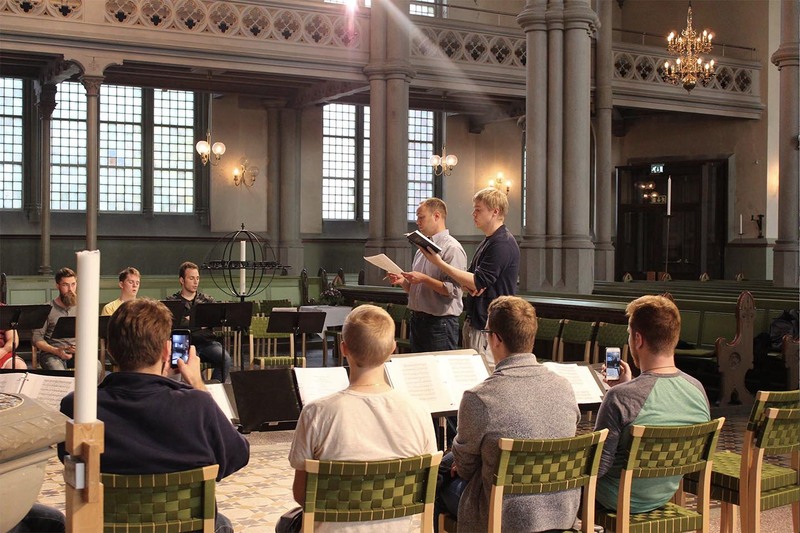 The Men’s Glee Club hosted conductor Jakob Patriksson, of Gothenburg, Sweden, in February 2015 as part of the International Conductors Exchange Program between the American Choral Directors Association and the Swedish Choral Directors Association. Three months later, Jones, who is also assistant professor of music and Naus FamilyFaculty Scholar, received an invitation to engage in a collaborative project with Patriksson’s professional male ensemble, Ars Veritas. A group of 12 students in the Men’s Glee Club was selected by audition in September 2015, and the group prepared for this collaboration throughout the academic year. Patriksson joined the group on campus for a week of rehearsals prior to a concert held in Kumler Chapel in April. "I immediately felt welcome and like a part of the group since everyone was genuinely interested in my arrival and our upcoming project," Patriksson said. "Everyone showed a great hospitality outside the rehearsals, and during rehearsal the group was highly receptive and fun to work with. A constant sense of brotherhood rested over the whole group." Their collaboration will culminate in a CD to be released in early 2017. Ars Veritas and Schola Cantorum performed and recorded music that is more than 1,000 years old. 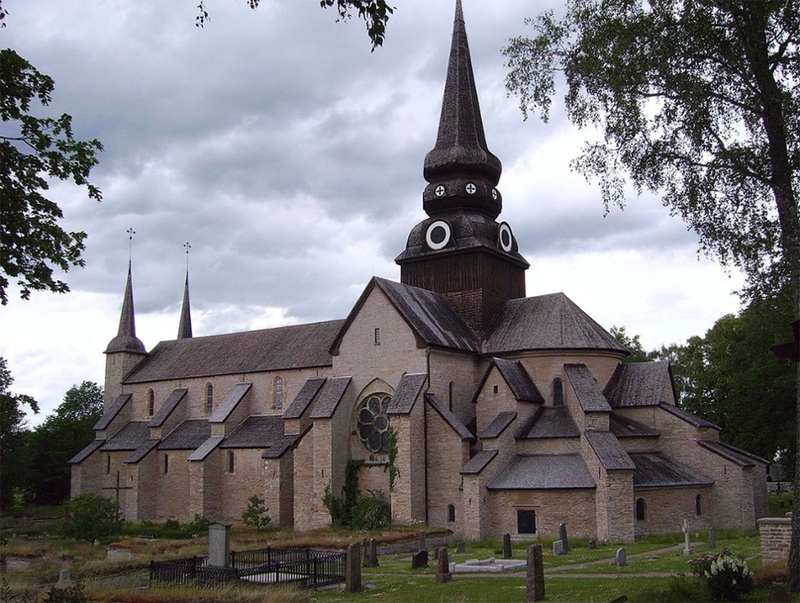 The recording was done over several days in Varnhem Abbey. Public tours of the church were held during the day so the group recorded at night. The summer sun in Sweden rises around 3 a.m., near the time the group finished each day. They also recorded world premieres written specifically for them, from music originally found in the 1582 collection of Piae Cantiones, which is the oldest surviving collection of medieval sacred, nonliturgical works from Sweden and other Scandinavian countries, Jones said. Some of the music was written with blocks and squiggles, very different from what we know today, said Tommy Wessendarp, Schola Cantorum member and senior music major. “It was like stepping into a time machine. Suddenly we're singing music from the time of the Black Death or the Crusades," Wessendarp said. Go to "Moments of Awe" at Miami Moments for all Schola Cantorum members' names, majors and reflections on their opportunity of a lifetime. Patriksson, who conducted the two ensembles with Jones, said, "Our groups quickly bonded on the musical plane. We were able to make music on a high technical and emotional level quite soon after starting our rehearsals, and a 'shared leadership' between Jeremy and myself worked better than I would ever imagine." "I speak for the whole group of Ars Veritas when I say I really hope we may continue this collaboration. Much was achieved in this project and much can be achieved in the future," Patriksson said. The project was sponsored in part by the College of Creative Arts, the department of music, the Men's Glee Club and Ars Veritas. Rehearsing at the Oscar Fredrik Kyrka, circa 1890, in Gothenburg, Sweden, where Jacob Patriksson (standing, right, next to Jeremy Jones, left) is also choir- and organ-master. The importance of including the arts in the total liberal arts educational experience was reinforced by this international and cross-cultural collaboration, Jones said. “Building bridges to world peace may be much easier and long-lasting if approached through the arts, and especially through our inclusive art of choral music,” he said. Music opportunities are not just for music majors. Of the 12 students that comprise Schola Contorum, only half are music majors. In the Miami Men’s Glee Club, 87 percent of the membership of the nearly 100 students are nonmusic majors, Jones said. That is typical of Miami's other musical ensembles. More than 10 percent of Miami students participate in a music ensemble or performing group. Open auditions are held after the first week of fall semester.